Johann Elias Ridinger (Ulm 1698 – Augsburg 1767). In the Year 1720. His Excellency Sire Count of Ohringen (Hohenlohe-Öhringen) has shot this entirely white fox himself close to Ohrenthal (near Öhringen on the Ohrn in the Ohrn district). 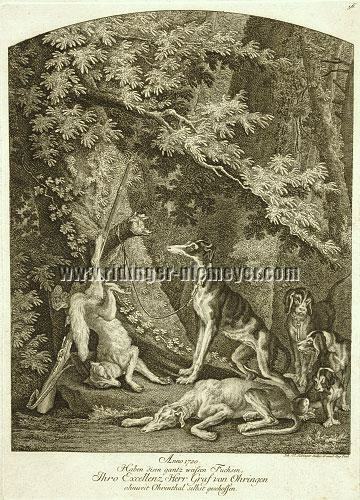 “The white fox hangs by one of the hind legs, beside him a strong greyhound lashed up, before one sleeping and still three other hounds” (Th.). With 18.5 cm quite instructive-dominating on the left the extremely long flint-lock gun by which the white one was bagged and on the barrel of which he now hangs. Etching & engraving. (1750/53.) Inscribed: Joh. El. Ridinger Sculps. et excud. Aug. Vind., otherwise in German as above. 13⅝ × 9⅞ in (34.7 × 25 cm). Thienemann & Schwarz 298; Ortega y Gasset, Meditationen über die Jagd, Stuttgart 1981, full-page ills. p. 65. – Sheet 56 of the Most Wondrous Deer and other Animals and like the following four other plates there with linings arched at top. – Lower and partly right outer margin barely disturbingly spotted. “ It’s a truly one-of-a-kind very special item and I congratulate you on having the resources to have found it … You indeed have some wonderful things for sale. These (ship) plans are indeed an exceptional find, Jan Hendrik, and I THANK YOU for making them available for sale. They are truly unique … Also – may I compliment you on your fantastic website display of the … plans – It is among the most professional and informative website I have ever seen! Mit Vielen Dank! !